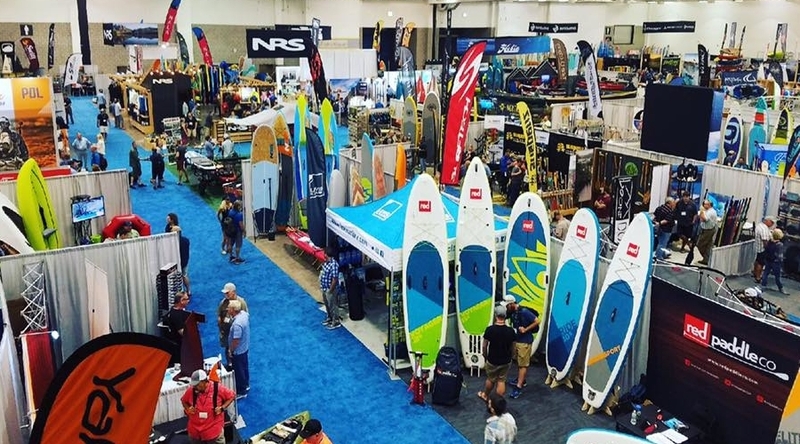 The inaugural Paddlesports Retailer show wraps up in Madison, WI today. And though the event is moving to Oklahoma City next year, by all accounts this year’s version was a well-attended success. It turns out that when you filter out the rest of the outdoor industry, the more ingenious and quirky paddling products are allowed to shine. Check out some of the highlights below. 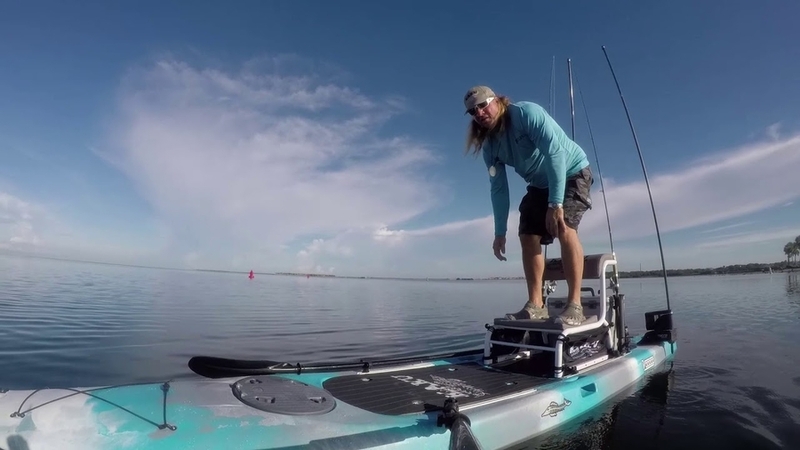 Kaku paddle craft have a way of standing out for being unusual – its Wahoo kayak was a cross between a SUP and a kayak. The Voodoo is aiming for that same cross-category appeal. It boasts excellent stability and can be paddled while standing or seated in a chair that offers two seating positions as well as a sight casting/poling platform. The chair on the Voodoo is designed to have a wide sitting area to give the angler more room to move around without feeling cramped. The seat can also be used as a standing platform, giving the angler an added advantage for sight casting. The craft’s large SUP-style open deck in front of the seat has ample room behind it for a good-sized cooler. Versa is a paddling system for kayakers with limited strength or endurance due to injuries, age or ability. It relies on a patented hinged mount that attaches to most sit-in kayaks and supports the weight of the paddle, resulting in less joint stress on the shoulders, elbows and wrists. The Versa paddle can be used straight or in an angled position, which further reduces the range of motion and torso rotation required to propel the kayak. 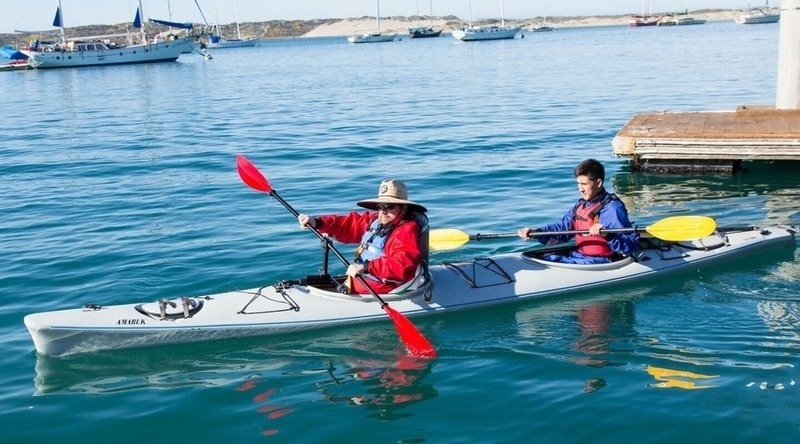 This makes the system ideal for people with shoulder or back injuries, health conditions that limit their endurance or any recreational paddler who wants to stay out on the water longer, with less effort. 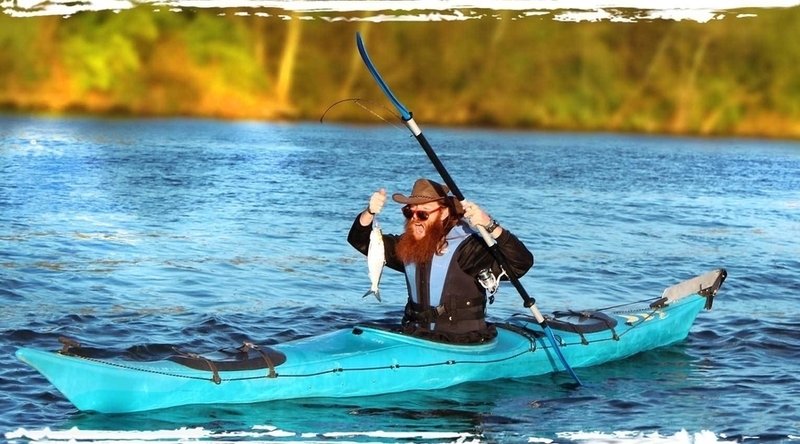 The paddle can also be use by a person with limited hand flexion or only one upper limb, making it well-suited for kayak anglers because they can now fish with one hand and paddle with the other. 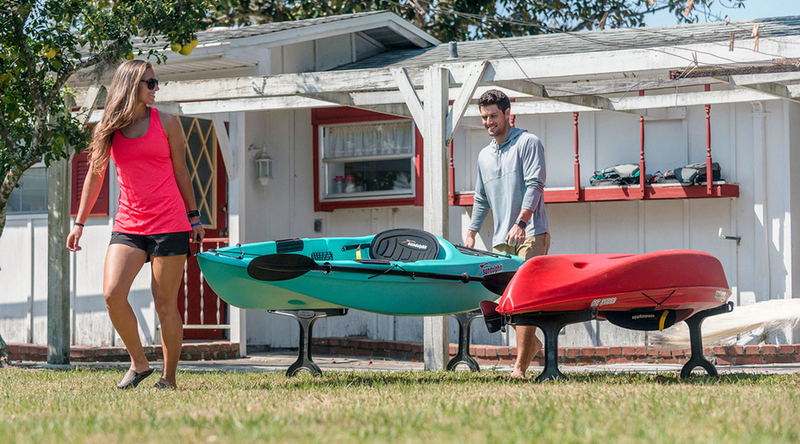 Shore Tee by FootStake is the clever kayak storage system that keeps your boat off the ground so it can dry out quickly and stay clean. 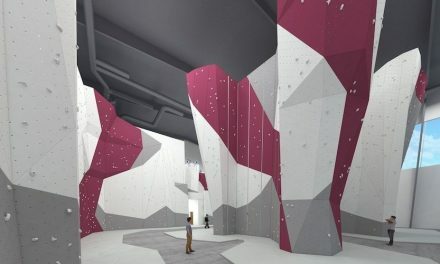 Installation requires one simple tool – your foot. Simply place the stake on the ground pointy side down and step on it. Once it’s secure, repeat on the other side. Then flip your kayak, canoe or paddleboard on top and you’re done. 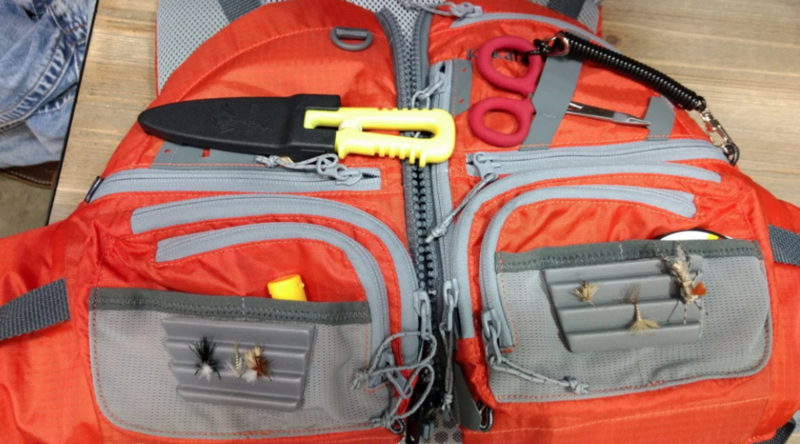 The ultimate kayak fishing life vest, the Leviathan has 14 pockets and multiple fixture options allowing anglers to carry lures, tools and gear. The high-back, performance, recreational life vest features body-mapped Gaia foam panels contoured to allow the life vest to wrap the torso in a secure fit. 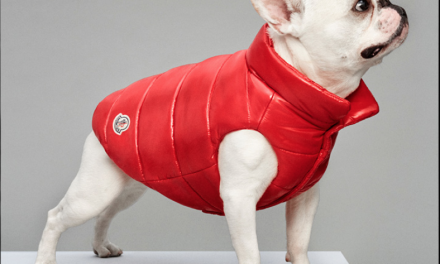 Fleece-lined hand warmer pockets are a bonus for those chilly days. The patented Fishing Paddle design allows the user to propel a boat while using the integrated fishing system to cast or troll for fish. Suited for use with a kayak, canoe, SUP or other personal watercraft, paddles can enjoy fishing and touring without switching between poles and paddles. The extruded aluminum paddle shaft provides stability and strength in a comfortable, easy to handle design. Blade angles adjust to suit paddling preference, while padded grips reduce fatigue. The Fishing Paddle also easily disassembles and floats.